A few weeks ago, a whole lot of my mother’s embroidery threads came to live at my house…. my mother, in her glory days, was a master embroiderer. 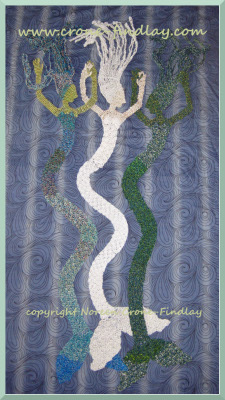 Sadly, she is no longer able to do needlework and there is no room for her embroidery threads in her new home. At first, I was incredibly saddened by the presence of her threads in my studio… I knew that she had had a hard time making the choice to leave her condo…. and the threads were symbolic to me of her decline. I also felt, oddly, that I was ‘snooping’ through her things as I sorted the threads and needlework tools. It was quite depressing. I felt like she had treasured her threads so much that I couldn’t possibly do anything with them that would match her dreams for them, and it brought up all kinds of ‘not good enough’ stuff. Very painful! Luckily, I have close loved ones who helped me shift my focus away from the painful focus, and to embrace the threads as my own, and to work with them in a way that is a celebration of all the delight that my mother felt in her needlework…..
And, so I started weaving with them, and then got the inspiration to use her threads to continue my shadow scarf series….. this time, to crochet mermaids! 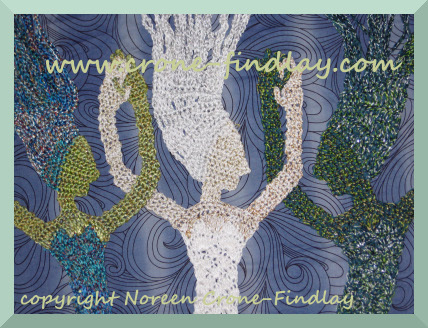 My mother always loved mermaids as much as I do, so it seemed right to me…..
And, so, I have been discovering the mermaids that were living in my mother’s threads- it has been a joyous discovery for me, and I am delighted with them! I have just finished the pattern, and have put it up on my website at: Crochet. (click on link). You never know where you will find joy and healing…. 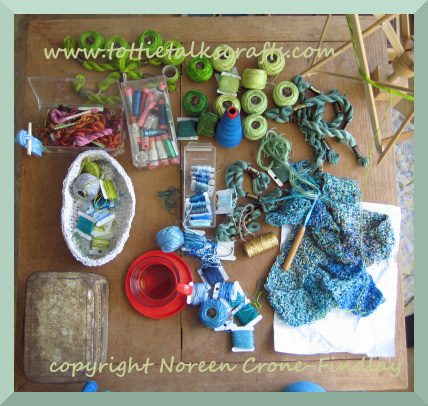 isn’t it amazing how often that it lives in the middle of threads, yarns and the tools of our needlecraft? So, here’s to imagination, and to creativity, and to the healing that they can bring- and of course, here’s to love, and to friendship, too…. and to all the tender mercies that they bestow on us! And, also…. here’s to mermaids…..